Nikon D50, fill-flashed with Sigma EM-140 DG Macro Flash, Tamron 180mm f/3.5, ISO 200 ; 1/400s ; f/5 ; Aperture Priority Mode and Rear Sync ; Handheld. Back in 2009, I had just gotten my hands on the “standard issue” Tamron 180mm f/3.5 Macro lens, which is the macro lens of choice of most of ButterflyCircle's members. I was eager to put my new toy through its paces and couldn't wait to go out to shoot butterflies. I recall that it was a sunny April Saturday, where the butterfly season was nearing its peak, when I went to one of our favourite puddling grounds. After a few attempts, the "butterfly fairy" finally smiled upon me. 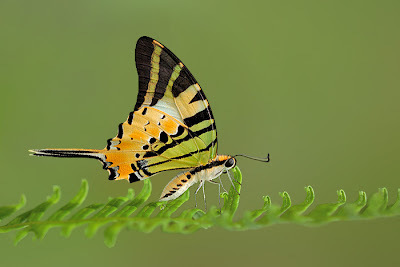 The Five Bar Swordtail landed on the edge of a clump of ferns. This allowed me to move in slowly and carefully with “tai chi” movements. As I got into position, raised my camera and looked into the view finder, I was delighted to see that the grassy slope in the background gave a smooth green background. I pressed and held the shutter, hoping to get as many shots of it as possible, but it took off after the second shot was taken. This is one of my favourite shots till today. Firstly, getting a shot of this butterfly is already quite challenging but managing to nail a sharp shot of a pristine individual with a clean green background made it a shot that I am extremely proud of. 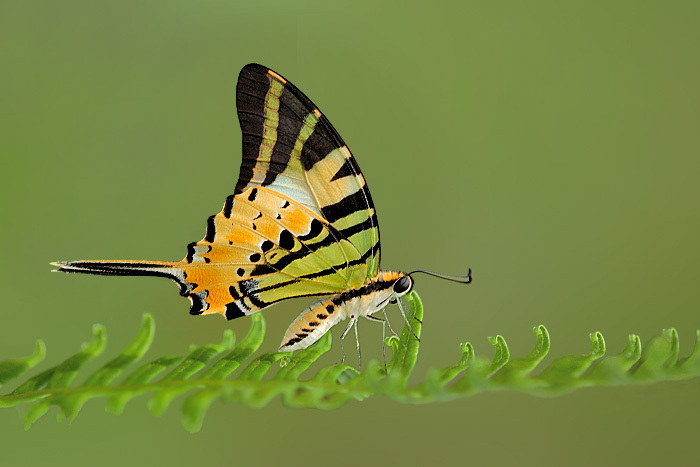 ButterflyCircle Photographer : Anthony Wong, an undergraduate in his mid-20's.